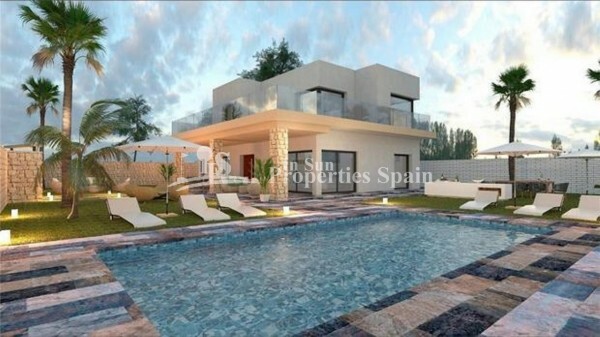 Located in the residential area of La Canada, San Miguel de Salinas is this superb 104m2 Detached Villa, `Brisas´ style. The urbanisation is situated just a short drive from the village of San Miguel de Salinas and nearby Las Colinas Golf course. The beaches of the Orihuela Costa along with the wide range of facilities are just 10 minutes away. South east facing, the villa distributes over 2 floors with the ground floor offering a spacious lounge, dining area, fitted and fully equipped kitchen, double bedroom and a bathroom. This was originally a 3 bedroom and so could easily be converted back. To the first floor you have a spacious double bedroom with ensuite and 30m2 terrace offering views to the community pool and fabulous views of the countryside to the salt lakes. Outside, you have off-road parking, and garden with several patios and private seating areas. The communal pool is just a short walk away and boasts landscaped gardens and plenty of sun-bathing areas. 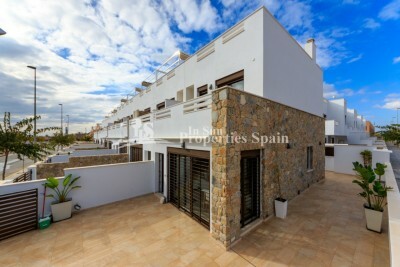 The property is sold part furnished with furnishings, fixtures and fixtures of a superior quality. There is AC to all rooms, Satellite TV and Alarm installed. San Miguel De Salinas is a popular place to live for many, known locally as the Balcony of Costa Blanca because it looks out over the plains of the River Segura, the neighbouring salt lakes and the Mediterranean coast. The locals of San Miguel are very welcoming to people from neighbouring countries and will always invite you to join in with their traditions. The village boasts an array of services and amenities including tapas bars, shops, restaurants, a pharmacy, health centre, banks, bus service, sports facilities, a municipal swimming pool and more.